Nokia is pushing its own music service called Mix Radio ahead on the default Music + Video app. It offers free music streaming (it works out of the box) and has an extensive library of tracks. While it is mostly streaming oriented, you can make tracks available offline in Mix Radio (they remain on the device only temporarily though). 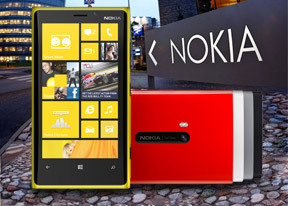 Update: Since the GDR2 update, the Lumia 920 now has FM Radio support, as well. Individual items can be pinned to the homescreen - like a song or video. 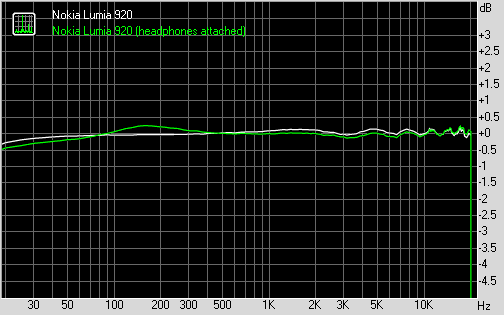 Sadly, the Nokia Lumia 920 audio output wasn't particularly great or worthy of the flagship status of the device. The smartphone has good volume levels, but its output is by far not the cleanest around. When connected to an active external amplifier, the Lumia 920 mostly managed good scores with the higher than average intermodulation distortion the only exception. However, most of its direct rivals are bordering on perfection in this scenario, so the Lumia 920 output is slightly disappointing. . The degradation when you plug in a pair of headphones isn't too bad but the intermodulation distortion increases even further. The stereo crosstalk increases very slightly and remains good for the case, but the overall output probably won't be enough to please the more demanding audiophiles out there.